When some of the PDP e-rats dedicated themselves to sleepless nights, just to distort the message of our Supreme Leader, Mazi Nnamdi Kanu concerning Atiku being a Cameroonian, little did they know that they were stirring the hornets' nest which could lead to the death of their principal's political career. The response of Nigerians to matters of paramount importance will tell you the extent to which the trauma that Nigerians have been subjected to, has made them decadent, even to the pitiable point of unimaginable docility, if not moronism. How could our leader have provided such a devastating information about an impostor having been imported and imposed on Nigerians, and all that the leading opposition party could do would be to join the multitude of ignorant people to laugh it off, or at best, attribute it to hallucinatory conjectures or malicious desperate denigration? 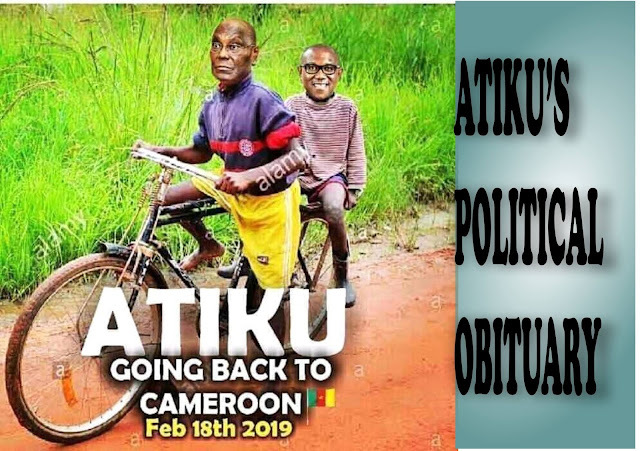 Mazi Nnamdi Kanu, in his broadcast from the UK, on Sat 2nd Feb, 2019, referred to the fact that Atiku was not originally born a Nigerian. He just made a reference to the fact that Atiku was originally born a Cameroonian. He stated clearly that it was by the reason of the referendum/plebiscite of 1961, when Atiku's part of Cameroon, which is the present Adamawa state, decided by a simple majority, to be joined with Nigeria, that Atiku became a Nigeria. Mazi Nnamdi Kanu then wondered why the platform and the opportunity provided Atiku's parents to transform from being a Cameroonian to being a Nigerian would be denied Biafrans. Now, even the satanic, criminal, and sharia document that is called the constitution of Nigeria stated clearly that the post of presidency shall be reserved for those who are citizens of Nigeria citizens of Nigeria by birth. The condition that the person must be a Nigerian by birth is unambiguously stated. Now, the pertinent question is: if Atiku was born in 1946 in Adamawa Cameroon, was he born a Nigerian? The constitution, on the other hand stated that somebody can still be qualified to contest for the post of presidency if the persons father or grandparents were Nigerians. Now, was Atiku's father who was born a Cameroonian a Nigerian? Atiku is no doubt a Nigerian, since the plebiscite that conferred Nigerian citizenship on his own part of Adamawa was held, and his area decided to join Nigeria. But Atiku Abubakar is unfortunately not qualified to run contest for the office of the presidency of Nigeria. Instead of these e-rats to make research to confirm the truth, they were moved to start posting and writing frivolities and trivialities that even primary school children would be ashamed of, about IPOB and Mazi Nnamdi Kanu. Just like the pro-Buhari’s attacked IPOB and Nnamdi Kanu for seeking to know why a non-school leaving certificate graduate should be allowed to contest when the constitution is against it. You can now understand that both persons contesting from the two well-known parties in Nigeria APC and PDP respectively are both disqualified for the post of presidency but you have professors of animals and doctors of HIV/AIDS practitioners in the same country. And somebody will tell you to vote for any of them at the expense of the constitution? If it were to be in a civilized country, none of the two candidates would even dream of passing by the road next to the one where they are selling the presidential nomination form. But this can only happen in Nigeria, where the rule of law had long been placed on indefinite suspension. If Nigeria is not seeking an opportunity to continue the unmitigated massacre of Biafrans, why will Nigeria be foot dragging on the issue of Biafra referendum, which Biafrans have been clamouring for, which also is being pursued in the nonviolent way? Now we understand why we must seek another approach to freedom. We also understand why IPOB and Mazi Nnamdi Kanu can never repeat the mistakes our Hero, Emeka Ojukwu made by seeking Biafra through the electoral process in Nigeria. If you don't want to be a Nigerian because you want Biafra, then you must be able to avoid anything to do with Nigeria and that we shall do starting with election boycott. Do not let anybody deceive you. The enemies are shouting that Mazi Nnamdi Kanu is in London enjoying but I ask those myopic elements, should he abandon his family because he wants to liberate somebody like you? Was he also enjoying with his family when he was in Kuje prison? I want to assure you that IPOB decision to boycott the election is properly weighed and found worthy to make an indelible awareness to our freedom. We must not let the enemies and evil ones divide us because any slightest mistake from us, the enemies will strike. But thank God we are more than ever formidable. And Biafra shall come in the end.